A contemplative embodied prayer experience that integrates movement, meditation and prayer. In these classes, Participants are invited to breathe, listen to scripture or a reading and open to invitation. As an invitation arises, Participants engage in movement and meditation through yoga poses. These are simple and basic poses; no yoga experience is necessary. 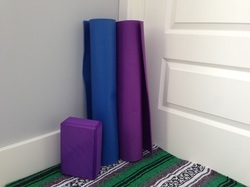 Participant need to wear comfortable clothing and may bring favorite yoga mat, although mats are provided.